The first home you buy is a special investment. Not only is it a place to live, but it is also a springboard for a new stage in your life, and often the catalyst for your foray into adulthood, responsibility and maturity. When purchasing a first home, it is important to work within a budget, ensuring you don’t overstep your ability to finance repayments. However, with the price of real estate at an all-time high, finding a suitable home can prove an extremely tricky task. For the pair of newlyweds who purchased the dwelling we are featuring today, they were confronted with the reality of living in a compact and tiny abode. Thinking as realists, prudently with wise economic boundaries, the couple settled on a one-room apartment. However, unlike many small studio dwellings, this one has been devised by the team at Arched Design, and boasts plenty of usable design features. If you reside within a one-room or small home, and would like to glean a few ideas for your own property, read on below and renovate with confidence and motivation! With a narrow width, and limited floor plan, the home is surprisingly welcoming and enjoyable. Cosy, comfortable, yet replete with 21st-century amenities, this residence embraces its size and imparts an affectionate aesthetic. As we walk up to the entrance of the home, the vista is one of an alluring and inviting nature. Warm hues leave an immediately welcoming first impression, while the storage to the right is essential for such compact living. Moving through the double doors and into the main dining area, we see the gorgeous yet simple furniture. This simplicity helps the room to feel larger than it actually is, while the designers have worked with negative space to ensure the home is enjoyable. A large square opening sits on the back wall, while built-in storage has been placed below. This storage works as a console table for the dining room, but also imparts a homely aesthetic, adding to the level of comfort and liveability. 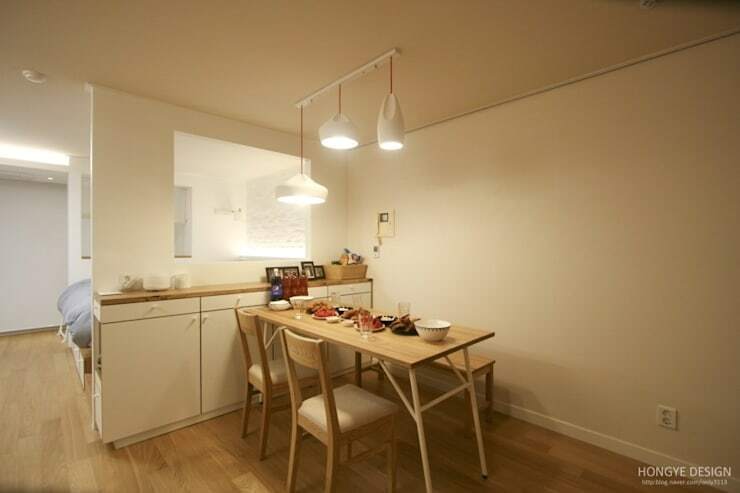 Feature light fittings hang delicately above the table, and help to segregate the area from other living spaces. They are engaging and provide additional light, which is then able to flow through to the sleeping space beyond. Turning around to take a peek at the home from an alternate angle we see the intriguing areas and individual spaces that create an effective and engaging design. The colour scheme is neutral and warm, with plenty of cream tones paired with soft light timber hues. This provides an additional level of comfort, while the light paint shade keeps things fresh. As this is a one-room apartment, it was crucial that the architects and designers correctly segregated and partitioned space within the home. In the bedroom area, this has been completed using a sleeping platform and built-in walls that don't entirely enclose the space, but add sufficient privacy. 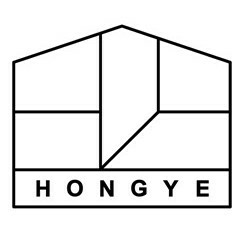 Moreover, this sleeping platform provides additional storage for the dwelling. 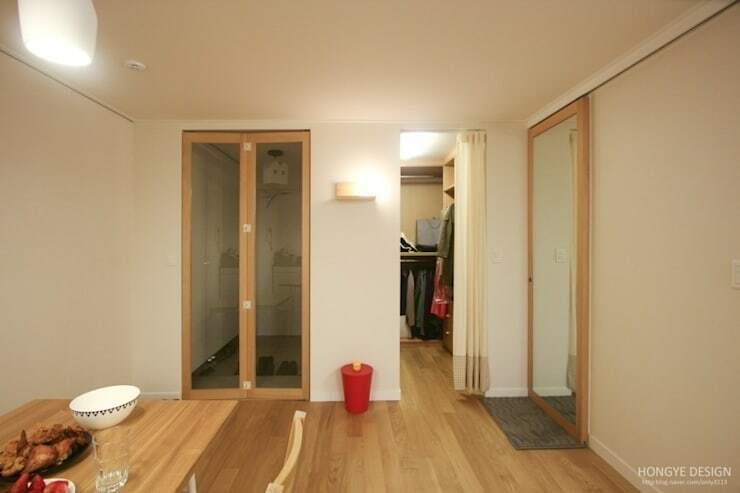 It is here that the occupants can keep their bed linen, clothing and other living appurtenances. 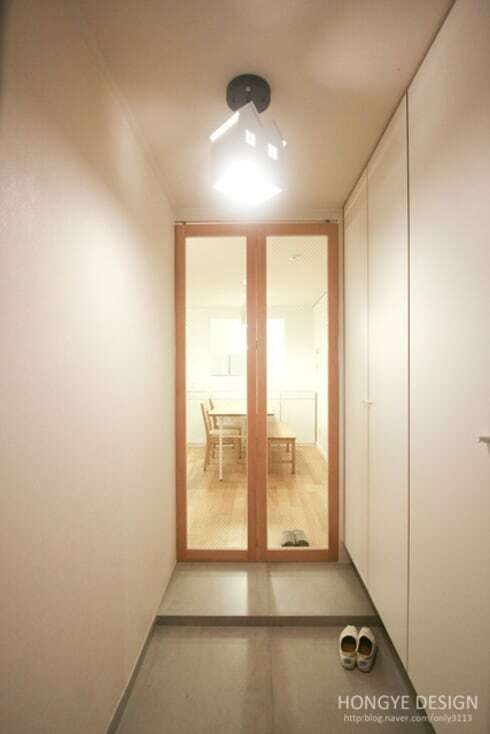 Openings on either side of the walls help create cohesion between the different spaces, imparting movement and airiness that is essential in compact abodes. Next up we take a look at a practical living space that works brilliantly to create a usable and functional area of enjoyment. In one-room apartments it is important to ensure each area of the home works in a practical way, and because space is so limited, this can definitely become a tricky task. Our feature home has tackled the issue very well, incorporating furniture that offers multiple uses. 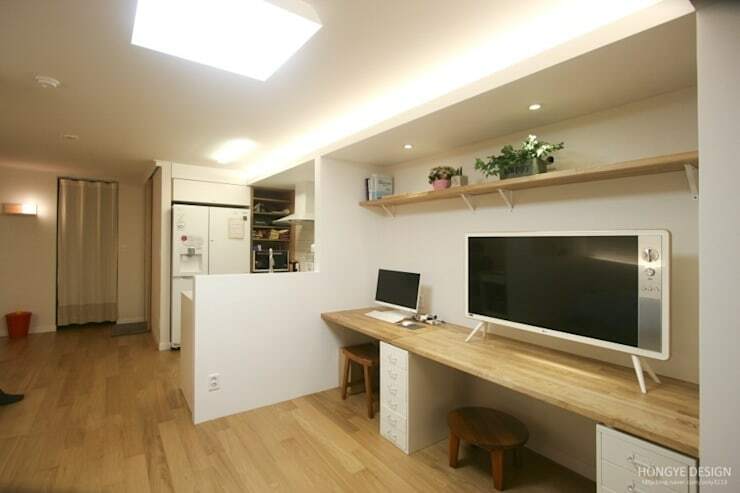 The desk space offers an area for the large television, while a small home office sits in the corner. Finally we enter the kitchen. Due to the fact that the home is so narrow in its width, the dwelling needed to maximise space in the kitchen, while still working with constrained interior proportions. The result is a highly workable kitchen, with a sense of practicality and usability. 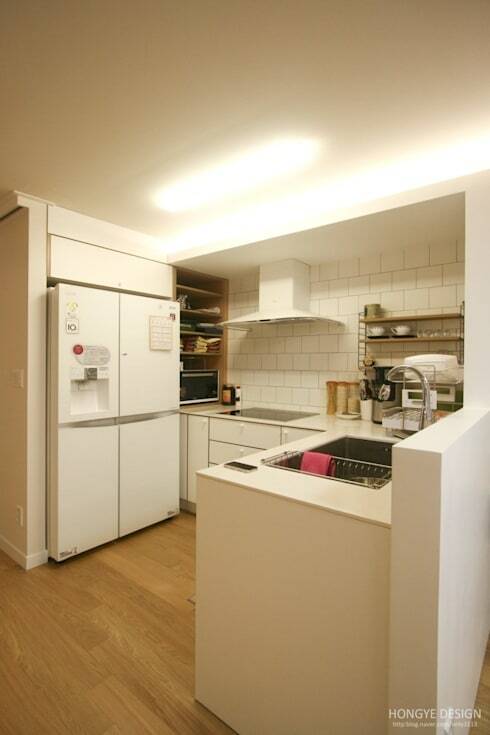 A huge fridge sits in the corner of the space, while the other appliances are spread out effectively. Could you live in a narrow and compact home?